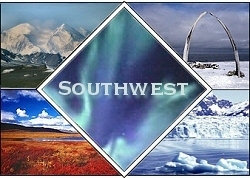 A panorama of Southwest Alaska ranges from the windy grasslands of the Aleutian Islands, the longest archipelago in the world sweeping 1,000 miles westward into the Pacific Ocean, to the surreal volcanic landscape of Katmai National Park to the emerald green island of Kodiak to the unsurpassed bird populations of the Pribilof Islands. The Alaska Peninsula extends 55 miles into the Pacific Ocean. Most of the area is covered with tundra. There are groups of trees over the hills on the eastern end of the Seward Peninsula and Norton Sound. The peninsula includes the largest lakes in Alaska -- Becharof Lake, Iliamna Lake, and Lake Clark -- and extends toward the Aleutians to encompass several world-renowned natural preserves. These include the Alaska Peninsula National Wildlife Refuge, Becharof and Izembek National Wildlife Refuges, Katmai National Park and Preserve, Aniakchak National Monument, and McNeil River State Game Sanctuary. The peninsula's mountains, volcanoes, turquoise waters, and marshy lowlands are home to moose, caribou, red fox, tundra swans, wolverine, sea otters, and eagles -- and world-class rainbow trout and five species of salmon. Katmai National Park is one of the world's premiere locales for brown bears, which congregate every summer to feed on spawning salmon. The park's Valley of Ten Thousand Smokes is famous for the 1912 Novarupta eruption, one of the most violent in recorded history. Southwestern Alaska is known for its remote, long and bleak Aleutian chain of rugged, volcanic islands curving about 1,200 miles west from the tip of the Alaska Peninsula and approaching Russia's Komandorski Islands. There are more than 200 islands in this chain of islands. Each island is the top of a submerged mountain belonging to a range stretching more than 1,100 miles into the Pacific Ocean from the Alaska mainland. A partially submerged continuation of the Aleutian Range, they separate the Bering Sea from the northern Pacific Ocean. Rocky headlands streaked with volcanic ash rise sharply from the sea. Almost treeless, the islands have a luxuriant growth of grasses, bushes, and sedges. On these islands more than 50 volcanoes are found, Mt. Shishaldin on Unimak being one of the active ones. The Aleutians comprise four main groups: Fox Islands, nearest to the mainland, including Unimak, Unalaska, Umnak, and Akutan; Andreanof Islands, including Amlia, Atka, Adak, Kanaga, and Tanaga; Rat Islands, including Amchitka and Kiska; and Near Islands, the smallest and westernmost group, including Agattu and Attu. The Semichi Islands, of which Shemya is the largest, are nearby. Here are untamed coastal regions, wild rivers, granite peaks and majestic glaciers, or the rugged beauty of Lake Clark National Park and Preserve - 4 million acres of expansive wilderness. Most of the islands are within the Aleutian National Wildlife Reserve. Whales, sea lions, seals, and sea otters are a common sight, as well as eagles, the rare whiskered auklet and the ancient murrelet. Halibut and three salmon species call the islands their home. The Aleutian Islands have few good harbors. The rough waters during violent storms so common in this part of the world, and numerous reefs make navigation treacherous. These islands are justly known for some of the most miserable weather on earth. High winds (williwaws) can rise without warning and smash through the islands at speeds of 100 mph. The wind blows nearly all the time, bringing lower wind chill factors. Heavy fog is common, as are heavy rains and cool temperatures. The southwestern mainland is the meeting point for Aleutian weather and Interior weather, and often experiences unsettled conditions, frequently accompanied by high winds. Almost all travel is by air and/or water. The Bristol Bay area serves as a major hub for commercial seafood harvests with the busiest commercial fishing ports in the world. Pristine lakes and rivers that empty into the Bay support world-renowned spawning and harvesting of all five species of Pacific salmon -- king, sockeye, silver, chum, and pink -- as well as rainbow trout, arctic char, grayling, northern pike, lake trout and Dolly Varden. Beluga whales and Orcas (killer whales) can be seen following the salmon runs. The area is home to caribou, moose, bear, and walrus, as well as small game such as beaver, porcupine, otter, and fox, and varied waterfowl. The well-known Kodiak Archipelago is part of this region. This is the largest group of islands in the region. The archipelago is home to the famous Kodiak brown bear, salmon, deer, elk, sea otters, sea lions, foxes, mountain goats, eagles, puffins, and numerous other sea birds. Alaska's Emerald Isle is varied-with ragged mountains, rolling tundra, rocky shoreline, and stretches of green spruce forests. The Pribilof archipelago, formed by tips of a sub-oceanic volcanic range, host one of the world's largest gatherings of marine mammals each summer when one million northern fur seals return to breed and give birth. St. Paul and St. George are home to sea birds such as puffins, auklets, murres, and rare red-legged kittiwakes and are situated along the migratory routes of many non-resident species. Rocky cliffs and beaches of the Pribilof Islands (St. George Island and St. Paul Island) in the Bering Sea support some of the largest sea bird (230 species) and fur seal populations in the world. Reindeer and Arctic blue fox also make their home here. On the afternoon of June 1, 1912 the volcano, Novarupta, on the side of Mount Katmai, erupted and sent a mass of hot ash rushing down a valley stream. The explosion was heard in Vancouver, British Columbia, some 1400 miles away. Over nearby Kodiak Island the sky turned ominously black as an immense cloud of ash, pumice, and gas billowed up from the volcano. Volcanic activity continued relentlessly for three days. When the material finally stopped moving, the valley was buried under this hot ash to depths up to 700 feet. This ash covered rivers and melted snow and glaciers. The rivers and melt water interacted with the hot eruptive deposits and formed hydrothermal systems. In 1918, Robert Fiske Griggs, a botanist at the National Geographic Society, led a team to the valley near Katmai and became the first to set foot on land that had once consisted of swamps and moist woodlands. It was now a stark and barren landscape. Griggs was surprised to see what appeared to be thousands of small steaming volcanoes. For as far as the exploring team could see, steam jets poured out of a sand covered valley and the surrounding volcanoes burped and belched as they released sulfuric smelling hot gasses. Griggs believed that the source of the “smokes” was a huge cavern of molten rock that lay closely below the surface of the Valley. He dubbed this simmering landscape the "Valley of 10,000 Smokes." In fact, these were not volcanoes at all but gaseous steam vents known as fumeroles. 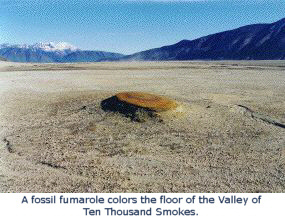 The hot material had vaporized the water running through the former valley floor as well as rainwater and spring water flowing into it later, creating hundreds or thousands of plumes of steam belching from fumaroles. The valley lived up to its name for nearly 20 years. Then the ash cooled, and the flow of liquid water on the surface resumed its inexorable work. Today the Valley is mostly a barren, light peach- to salmon-colored crust of porous, spongy, brittle rock and sand. The surface is mostly flat, except where the Valley's three main rivers have eroded canyons up to 100 feet deep.